It won’t be wrong to say that mobile devices have become an integral part in the way we communicate and apps are emerging as an indispensable part when it comes to our interaction with technology. In fact, the entire world is in the realms of mobile and consumers everywhere are using their smartphones and tablets to find and get in touch with local businesses. If we go by the research and study done in this context, it is evident that small businesses are making savings as high as 800 million employee hours per annum by resorting to mobile apps. Also, around 31% of small businesses with less than 30 employees are going the app way and have enhanced their productivity with increased customer satisfaction through smooth mobile experience. Hence, developing an app for your small business is very important if you wish to have a competitive edge over your competitors. However, there are certain effective strategies which need to be kept in mind before you proceed with your small business app development. 1. The design strategy: Your app can become a commercial success only if it is unique in its approach. However, uniqueness should not complicate your app. Keeping it simple is the best idea. Hence, the app design should be simple, consistent, user-friendly and the one which reflects your brand completely. Including texts, visuals, video contents and resources you already use in several other channels allows you to develop an app that gives your customers a native feeling. Also, it must be kept in mind that more the app design is collaborative, interactive, energetic and fun, more the chances of customers getting attracted to it so the designs, prototypes, animation and the user interface should be visually appealing. 2. The content strategy: A dedicated mobile app can work wonders for your small business. However, for making your app a hit midst the consumers, it is very important to work effectively on the contents, tools, and features of your app which can keep the customers hooked to the app, influence them to keep coming back and enhance your sales. It should serve as a one-stop-shop for the customers with extensive features of user feedback, customization, social media integration, offline capabilities and consistent app updates. In addition, you can also offer loyalty cards, in-app coupons which will give better deals to customers and more business to you. Also, providing easy communication within your app through call-to-action (CTA) buttons and email will allow your customer to be in constant touch with you. Furthermore, QR enhanced stickers; online tools and social & media feed, fine typography needs to be included in your mobile app for better performance. 3. 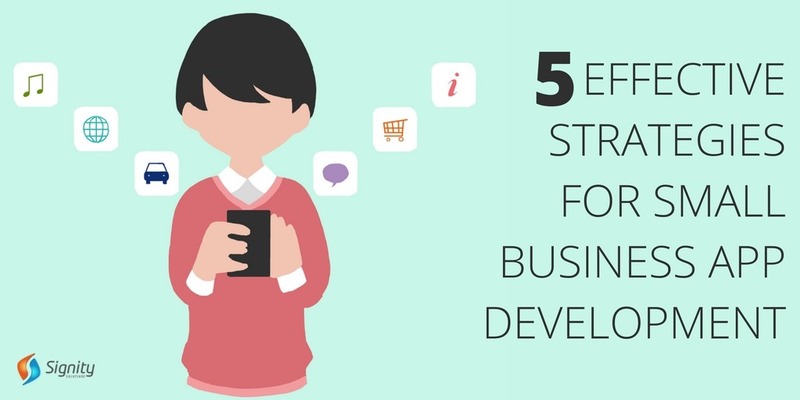 The development strategy: For an effective app development it is very important to hire developers who know their work best like the ones at Signity Solutions. The developer should know the essential elements for your app’s success, the goals you are working to achieve along with how you intend to use your app. Is it a part of SaaS product or is it going to be used on an e-commerce platform? It is very important to be on the same page as your developers so that they understand your requirements completely. For this, you need to communicate with the developers regarding your app before you hire them. Smooth communication is the key to success so be upfront about your app’s development process, establish a project timeline and keep checking it regularly to monitor progress. The developer should have thorough and apt knowledge of elements like app approval, app downloads and how to boost your app store optimization (ASO) before proceeding with app development for small business. 4. The marketing strategy: App marketing is very different from the usual marketing. The organizations with the most successful apps are the one that is working extensively towards marketing their app in order to attract more and more customers towards it. It must be known that a mobile app is a major connection between a brand and their customer. In fact, a customer’s 90% of time spent on mobile is somehow dedicated to the use of app alone. Hence, you need to tackle unique challenges of targeting problems, app rankings, search engine ratings, unfamiliar channels, download versus users and a lot more. Strategies such as key performance indicator (KPI) should be applied to analyze app store rankings, optimize app store rankings, acquisition of organic and loyal users along with cost per download. In addition, you should partner with marketing experts and work towards your mobile app advertising through ad networks and social media channels for optimizing your marketing efforts for app usage analytics targeted media buying etc. Moreover, studies also reveal that 80% of consumers are willing to receive location-based alerts on their mobile phones so investing in geofencing and push notification marketing strategies can be a good idea for boosting the presence of your app. 5. The engagement and support strategy: It is very important to keep your customer engaged or else it won’t take them much time to uninstall your app. An app made for multiple social platforms engages more customers. According to a recent survey, 27% of the Indian consumers prefer purchasing goods on social media and thus, it can really help in boosting the presence of your app midst customers. Also, the app should be able to load faster than a mobile website and the download time should not exceed more than 5 seconds. The experience that your app provides should be unique and superior to any other app experience they have previously had on mobile. Avoiding confusing information and offering simplest of experiences to your customers can lift your brand to an altogether new level because it is seen that around 86% of customers are more likely to purchase from your app if they are not confused with excessive, unnecessary information. Apart from this, you should also test your app for bugs and fix it beforehand so that your brand value remains consistent midst the customers. So, applying the right strategies at the right time will surely help you in developing your app effectively and shall let you pave new avenues of success. For any further queries regarding mobile app development, feel free to drop a mail at sales@signitysolutions.com. We would be happy to help you.